Radicchio has been around for quite some time: Pliny mentions the marvelous red-lined lettuces of the Veneto region in his Naturalis Historia, noting that in addition to being tasty they're good for insomnia and purifying the blood; he also says it was the Egyptians who bred radicchio from its more wild ancestor, chicory. In the Middle Ages it was especially popular among monks, who welcomed anything that would add zest and flavor to the simple, predominately vegetarian diets proscribed by their orders. Not that the plant was limited to monastic kitchens; it also figured prominently on the tables of nobles, both cooked and raw: In 1537 Pietro Aretino advised a friend who had a garden to plant it, saying he much preferred it to "aroma-free lettuce and endive." While tasty, this radicchio isn't the radicchio rosso we know today: the modern radicchio with its rich wine-red white-ribbed leaves was developed in the 1860s by Francesco Van Den Borre, a Belgian agronomist who applied the techniques used to whiten Belgian endive to the plants grown around Treviso. 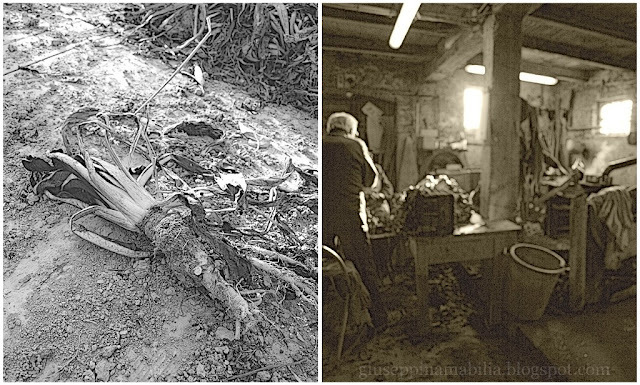 The process, which is called imbianchimento, is quite involved: the plants are harvested in late fall, their outer leaves are trimmed and discarded, they're packed into wire mesh baskets, and they're stood for several days in darkened sheds with their roots bathed in steadily circulating spring water that emerges from the ground at a temperature of about 15 C (60F). 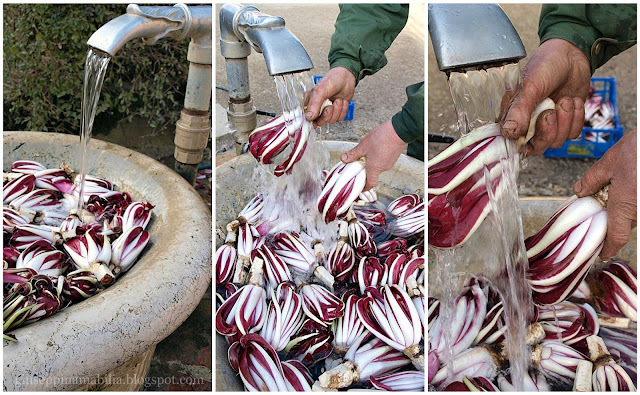 As they bathe the leaves of the hearts of the radicchio plants take on the pronounced wine-red color that distinguishes them (the deeper the red the more pleasingly bitter the plant). 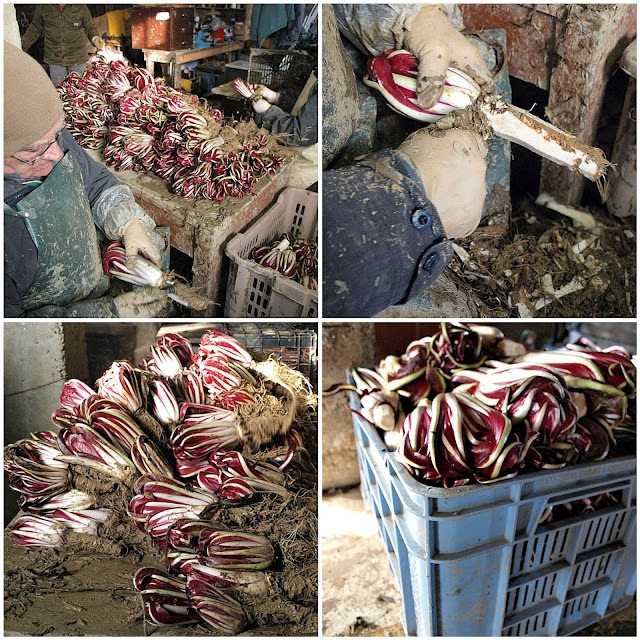 At this point the farmer unties the bunches, strips away the outer leaves and, trims the root (the tender part that's just below ground level is tasty), and sends the radicchio to the market. I found this text here, it’s very interesting and you can find recipes also. So, this is a short history of Radicchio Tardivo di Treviso a wonderful vegetable that grows in the region of Venice. 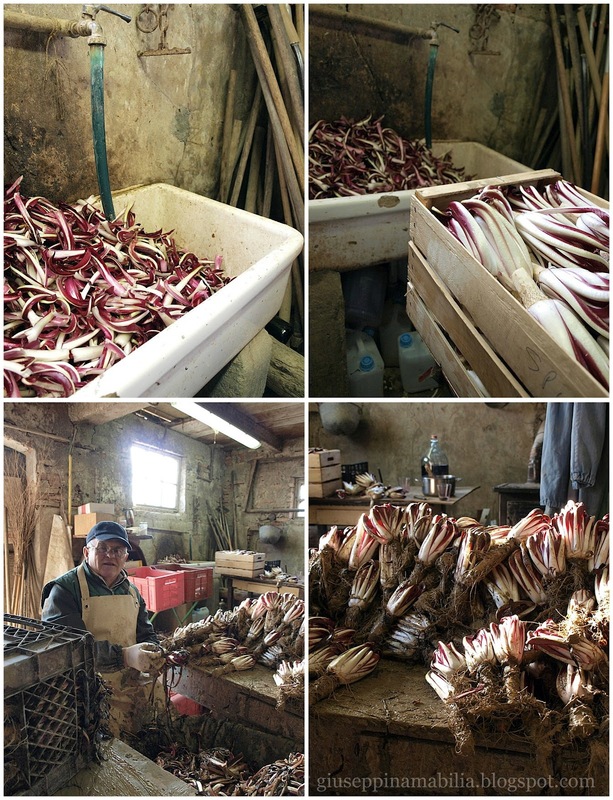 Last week we were in Italy and we went to see my friend Lorenzo who’s a farmer producing Organic Radicchio and we had the chance to arrive on Monday, that’s the day they are “cleaning” Radicchio before to send it to be sold. We had the feeling to enter into another time, another century maybe: when Radicchio comes to our tables we only see a marvelous edible flower but we don’t know anything about the great work that’s beside it . I took some photos so that everybody can see the hard work and the love & passion of these men . Cleaning up : a big work! We had really good time learning so much about the history of Radicchio, drinking hot red spiced wine, talking with these men so simple and so wise . Lorenzo doesn’t have a website but if you want to buy his Radicchio I’ll be glad to give you his contacts, just ask me, I know he can deliver in Europe also, in some cases. The final result : amazing !!! Very interesting ! I did not know it was such hard work to make the raddichio a radicchio. those cooked in the chimney look delicious ! Che meraviglia Giuseppina. Ora mi leggo la storia, così rispolvero l'inglese. QUi il radicchio lo trovo a prezzi esorbitanti ahimè ! Giuseppina questo post è commovente. Il tuo occhio ha colto dei particolari unici e significativi. Grande stima per la tua sensibilità. Grazie per condividerla, a me dà un valore aggiunto alla giornata. Il fatto di avere il radicchio a disposizione tutto l'inverno, quasi da non poterne più, ci fa dimenticare tutto il lavoro che c'è dietro a questo meraviglioso ortaggio! Sapessi quanto mi manca invece ( beh....ho fatto scorta comunque e lo sto facendo conoscere ai francesi )Treviso.....meravigliosa piccola città , grazie del saluto , mi scalda il cuore ! Ich hatte keine Ahnung, dass die Ernte Radicchio ist ein so komplexer Vorgang. Vielen Dank für den interessanten Artikel. Observing the whole process is very interesting, thanks for the post.